You can now plan your holiday a year in advance! Sunpreview is an online service offering weather forecasts for 365 days. This website, available in more than 20 languages and provide access to all the weather forecasts for the coming year. 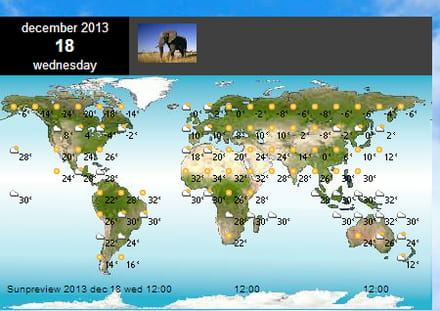 The purpose of Sunpreview is about identifying the major weather trends around the globe. This system is based on specific weather archives collected since 2002 and the data is updated in real time. Published by deri58. Latest update on December 16, 2013 at 10:43 AM by deri58. This document, titled "Get your weather forecast for the coming year with Sunpreview," is available under the Creative Commons license. Any copy, reuse, or modification of the content should be sufficiently credited to CCM (https://ccm.net/). Instagram : How to print your photos?